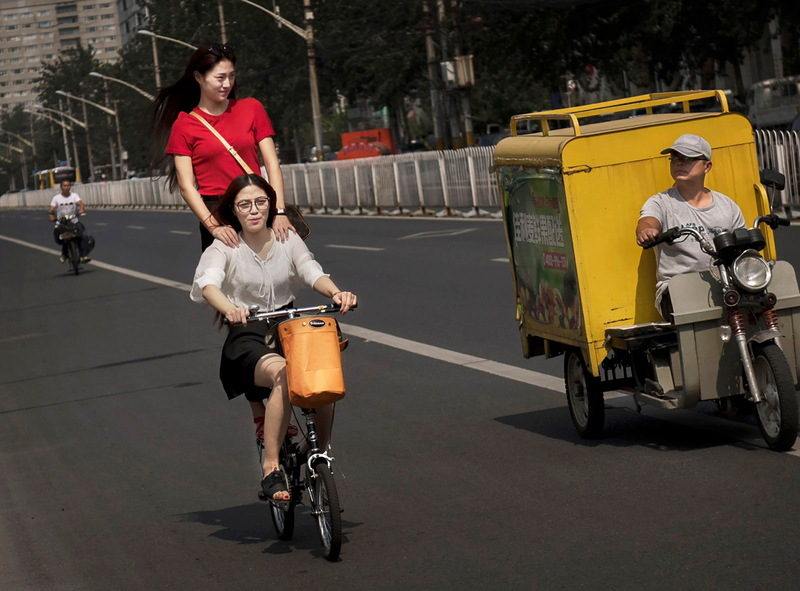 Women ride a bicycle together on a street in Beijing, September 10, 2014. Kevin Lin is the China Program Officer at the International Labor Rights Forum. His work is focused on labor rights and civil society in China. Correction: Luo Xixi’s allegations were made on Weibo in January 2018. An earlier version of this post misstated the year and failed to state that Luo’s allegations led to professor Chen’s dismissal from Beihang University. China amended its Women’s Protection Law in 2005 to outlaw sexual harassment and permit victims to sue in court. In 2012, a national regulation protecting female workers obligated employers to prohibit and prevent sexual harassment in the workplace. But these provisions are vague, providing little guidance to courts or lawyers on questions such as: How much harassment gives rise to legal liability? If the harassment is by a coworker, when is the employer liable? If there is harassment, what remedies are available? Facing this opacity, few victims have sued employers for sexual harassment. Where they have, the results are not encouraging. In what is often considered China’s first sexual harassment case, a woman complained that her boss repeatedly touched her body while promising her a better job, invited her to his hotel room, and withheld her bonus when she complained. The Xi’an court dismissed the claim, citing a lack of direct evidence and difficulty confirming her allegations. In my review of nearly 20 sexual harassment cases, there were many in which courts, like the one above, have found the victim’s evidence insufficient. One reason for this is the significant emphasis that the Chinese legal system places on physical evidence as opposed to oral testimony. In other cases, courts find that the victim failed to demonstrate the “harassment” was unwelcome or nonconsensual. In 2005, Xinhua reported that only 10 sexual harassment cases were filed since 2001 and only one plaintiff prevailed. Even in cases where the plaintiff wins, compensation is paltry. In the earliest known successful case, in which the victim’s supervisor kissed and molested her without consent and then repeatedly sent inappropriate text messages, the court awarded an apology and 2,000 renminbi (under $300) for emotional distress. A Hainan court ordered compensation of 1 renminbi to three men who were fondled and kissed by an advisor to their employer. In an unusual instance where the court awarded over 100,000 renminbi ($15,000), the unwelcome sexual advances were found to be the cause of the victim’s schizophrenia. The cases highlight the many obstacles that dissuade victims from suing. One manager lobbied a female employee to withdraw her complaint to the police about a coworker repeatedly ejaculating into her teacup. Not surprisingly, retaliation against complaining victims is also common, including forced resignations, dismissals, or retaliatory harassment. When a lawsuit is filed, employers have brought countersuits alleging defamation or requested a court-ordered psychological evaluation of the victim. Although victims may not fare well in court, not all employers are simply permitting sexual harassment to occur without consequence. In a 2013 case, Walmart fired an employee after several female workers alleged that he rubbed his cheek against theirs, touched their shoulders, and sent harassing WeChat messages. The terminated employee sued Walmart, denying his behavior and claiming that he was fired without sufficient cause. The court agreed, explaining that only one alleged victim testified and it was unclear who controlled the WeChat account, and therefore ordered Walmart to compensate the fired employee. In such cases, courts are reluctant to credit the victims’ oral testimony or to conclude that sexual harassment occurred. Nonetheless, these employers are dismissing alleged harassers, even if they may need to compensate them later. In the United States, many believe that litigation has failed to provide victims with a meaningful remedy, but the #MeToo movement may inspire some changes to the laws governing sexual harassment. Similarly, in China, there is hope that #MeToo will provide the political push for the government to adopt measures that make litigation a more meaningful mechanism for remedying sexual harassment. Sexual harassment is a labor rights issue because it so often occurs in the workplace. While journalists were among the first to popularize the #MeToo movement, the Foxconn worker’s story is a reminder that women in blue-collar jobs also regularly experience sexual harassment. A 2013 survey by an organization for female workers, Xiangyanghua (向阳花), showed that an astonishing 70 percent of the 134 female factory worker respondents experienced sexual harassment. And, women in these jobs, due to their more marginalized social status, may have fewer avenues to fight back than professional women. So what can be done to combat sexual harassment in the workplace? The Foxconn worker’s article makes several concrete proposals, such as breaking the taboo of discussing sexual harassment, providing anti-harassment trainings, and establishing grievance procedures to investigate complaints. These necessary measures on their own do not guarantee protection, at least not without employees actively demanding accountability. Mobilization in the public sphere as well as the workplace remains essential to drive social change. Such efforts should be supported by stronger legal mechanisms. Although China has had “Special Rules on the Labor Protection of Female Employees” in place since 2012 to prevent sexual harassment, workers rarely see its enforcement. The lack of an explicit provision in the labor laws, or in labor contracts (if workers even have one at all), means women lack even minimal legal protection. There is a call at the global level for the International Labour Organization (ILO) to adopt a convention concerning gender-based violence in the workplace, which countries would then be asked to adopt. China should use this proposal as a guidepost for advancing its own national laws and policies. This moment also presents an interesting opportunity for the feminist and labor movements to connect and share strategies. Civil society organizations in both movements wrestle with the interplay of gender and work. Further, both have struggled to keep their operations going in light of pressure from authorities. The female worker labor group that conducted the aforementioned survey, Xiangyanghua, was forced to close down in 2015, allegedly because it assisted workers in strikes. The labor movement might benefit from learning more about the use of strategic public and media activities and policy advocacy; the feminist movement may draw lessons on labor mobilizing and giving voice to not only professional but also factory and retail workers. Such partnerships, while recognizing differences, could be a powerful force in pushing for some of the legal, policy, and workplace reforms necessary to combat sexual harassment. The #MeToo movement finally echoed loud in China when Luo Xixi, a Ph.D. graduate from Beihang University, made a public allegation on January 1 that her professor Chen Xiaowu had sexually harassed her and seven others over the past 12 years. More sexual harassment accusations against professors and other authority figures are also showing up. Over 8,000 students and alumni have signed petitions demanding anti-sexual harassment mechanisms on campuses. The notion that “women hold up half the sky” was promoted more than 50 years ago, over 50 percent of students in universities are female, and China’s female labor force participation rate is around 60 percent. However, the reality tells a different story. The pay gap between men and women is still huge, discrimination in jobs is everywhere, and the glass ceiling still exists, especially in corporate executive and leadership positions. Looking at the all-male line-up of the Politburo Standing Committee, the fact is clear: men will usher China into the so-called new era. The #MeToo movement reveals the reality that the right to “hold up half the sky” is granted by men. Deep down, sexual harassment is about gender discrimination and unequal access to power and resources. Luo Xixi’s allegation is an awakening of female consciousness, and the message is delivered: if you want your voice to be heard, and your position as a victim to change, take action and speak out, but not too loudly. Many sexual harassment cases on campuses have been exposed, but none of them has achieved what Luo’s case has. Chen Xiaowu, the perpetrator, was stripped of his positions and titles. Even more significantly, the Ministry of Education has agreed to introduce anti-sexual harassment mechanisms on campuses. Apart from the global #MeToo movement, Luo has been smart in her approach to Chinese authorities and the media. She has consistently communicated with the authorities in a mild but determined manner, collaborating with the disciplinary committee to collect evidence. Simultaneously, she has reached out to journalists and used social media for help and advice. She has received overwhelming support from media and feminist advocates. It’s easy to criticize and scold, but it’s not as easy to voice constructive suggestions. Providing useful information to the authorities (such as suggesting a sexual harassment prevention mechanism), engaging in a reasonable discussion about sexual harassment and equal rights on social media, and submitting proposals to address sexual harassment by three members of the Chinese People’s Political Consultative Conference all have pushed the government to respond and take real action. Providing constructive advice is more useful than making sharp criticism, especially in China where authorities and people value face and image. Credit for #MeToo in China also goes to a growing feminist awakening over recent years. However, the closure in March of Feminist Voices and ATSH, social media that gave voice to sexual harassment accusations and equal rights issues, means a new approach needs to be found. From early January to the Spring Festival, over 8,000 students and alumni signed petitions demanding their schools implement policies to prevent sexual harassment. How has the #MeToo movement in China mobilized so many within the same harsh environment where many other social movements have been suppressed? The primary reason is the incredible courage, wisdom, and ability of a young generation enraged by the prevalence of gender inequality and repression, which has nurtured an unyielding determination for change. The indignation of the generation born after the late ’80s stems from the day-to-day conflicts experienced within a system that subordinates women to men, despite their equal levels of education and other qualifications. This indignation is the lifeblood of the social movement. But Chinese society is rife with inchoate indignities. Repression has undoubtedly had a chilling effect on speaking out, giving rise to fear among many before and after they decide to resist. However, these young people are less fearful than older generations—not out of naivete, but because their mentality and material resources are not yet beholden to any particular establishment. It has been clear to the core initiators of this movement that their campaign must be center-less, flexible, creative, and swift. Rather than expecting a single person to contact thousands of supporters on her own, the movement saw leaders rise up of their own accord to organize groups of classmates and alumni at 70 different universities. This networked guerrilla movement was much more effective than a centrally planned and executed campaign would have been at addressing censorship concerns and at allowing members to exercise individual initiative. Those within the movement also were skillful in their use of Internet technology to avoid surveillance. For instance, they used QR codes to lead potential supporters to the petitions as quickly as possible because censors would delete petitions within hours or even minutes. The young people involved in the movement were also savvy about tailoring the presentation of their identity and interests. The motivations of students combating sexual harassment could not be easily smeared. Further, identifying themselves as “conscientious and innocent youth” also allowed for the mobilization of a large population, even transcending national boundaries—more than 300 overseas Chinese students and scholars signed a petition in support of further advocacy at the end of the January. The momentum on this issue in the U.S. has also lent a degree of legitimacy to the efforts in China, although the demands and methods have been somewhat different in the Chinese context. Now that the Ministry of Education and some universities have promised to establish mechanisms to prevent sexual harassment, the #MeToo movement has made real progress toward its goals—a truly extraordinary achievement within the current climate for grassroots action in China. Ultimately, credit for this success should be ascribed to the growing popularity of feminism over recent years in response to the aspirations of young women in China. The Chinese government has failed to deter girls from believing in feminist ideals despite constant crackdowns on feminist activism and campaigns to stigmatize feminism. At the heart of this popularity is a resilient community of self-organized feminists poised to channel widespread anger at the unequal status of women into social and political change at any given opportunity, just as we are witnessing now with the #MeToo movement. There has been a dearth of #MeTooInChina posts explicitly describing LGBTQ experiences. Does this mean that LGBTQ people are excluded from #MeTooInChina organizing, and moreover, China’s anti-sexual harassment movement generally? The answer is complicated. On the one hand, LGBTQ people in China are experiencing sexual harassment just as are heterosexual or cisgender people, and possibly even worse. But, the LGBTQ invisibility in China’s public space is deep-seated. According to UNDP and the Beijing LGBT Center’s national survey in 2018, only around 5 percent of LGBTQ people in China choose to come out at work, at school, or within their religious communities. The lack of explicit LGBTQ narratives shared in the #MeTooInChina campaign indicates that while the general public in China has become more open to criticizing sexual harassment, it has not yet provided a supportive space in which survivors are comfortable disclosing their sexual orientation, gender identity, or gender expression. Nonetheless, queer women have played central roles in the feminist anti-sexual harassment movement. Standing on a long history of feminist resistance, a new generation of younger feminist activists emerged in 2012, and combating sexual harassment has always been part of their agenda. This new wave initiated campaigns like the “I can be slutty, but you can’t harass me” performance on the Shanghai metro in 2012 and Meili’s 1,200 mile trek against campus sexual abuse in 2013-2014. In all these campaigns, queer women were at the front lines. Similarly, there were three queer activists amongst the Feminist Five, a group of women detained in 2015 for planning to distribute anti-sexual harassment stickers. The reason why queer women are so present in the Chinese feminist movement, according to Zhang Leilei, a #MeTooInChina campaign organizer, is that this movement provided a small but critical space in which people “are more welcome to experiment and to explore alternative ways of life,” and that provided her “with political frameworks to reflect on my queer experience.” Indeed, queer (self-)presentation has been very visible in this movement. For the month of March, 2017, Leilei committed to personally wearing a billboard protesting sexual harassment, and called for other Chinese people to do the same. Leilei also planned to wear pink short hair, a T-shirt, a pink puff skirt, and a pair of pink slippers along with her billboard, intending to disrupt what is considered an “appropriate” dress code for women. While explicit coming-out stories are largely still absent from #MeTooInChina, the movement has been strongly influenced and supported by the continued contributions of the Feminist Five, Leilei, Meili, and many other queer activists that have been fighting against sexual harassment. Chinese feminist activism has provided spaces and tools for young people to critically reflect on their personal politics and to voice their political demands, which include queer women and other LGBTQ-identified people. By talking to Leilei and Meili, two leading young feminist activists, I can see their confidence in their queer tactics and their long-term visions for both feminist societies and queer lives. Sexual harassment is not only a social problem but also a legal issue. The prevention and treatment of sexual harassment is the legal responsibility of schools and employers, and the #MeToo movement necessarily involves promoting accountability. What role can lawyers, especially public interest lawyers, play in this movement? It is said that Dr. Luo, who complained to her university about what she suffered as a student, had initially consulted with a lawyer and considered litigation; but, she chose an alternate approach. Indeed, lawyers did not play a significant role in what developed into a movement involving thousands of young people requesting that their universities establish mechanisms to prevent sexual harassment. It was only one month after Luo’s report, when the joint letter actions were drawing to a close, that 13 lawyers issued a statement against sexual harassment and stated their willingness to provide legal aid for victims. This is quite different than the role played by lawyers on this issue in earlier years. In 2012, a collective action of lawyers on sexual harassment was prompted when the Shanghai Metro’s official Weibo account issued a post requiring women to dress appropriately in order to avoid sexual harassment. Starting in Shanghai, many lawyers used “open government information” provisions to request disclosures of measures the public transport authorities took to prevent sexual harassment and later jointly proposed the establishment of a mechanism to prevent sexual harassment. Also in 2012, public interest lawyers were part of a broader advocacy campaign that resulted in the amendment of a national regulation on the protection of women that made employers responsible for preventing sexual harassment. So why in the #MeToo movement have lawyers played a less active role? This is related to the setbacks suffered by all of civil society in recent years. Some legal advocacy NGOs have been forced to close, and taking joint actions on public issues has become more sensitive. Further, in November 2016, the Ministry of Justice restricted lawyers from engaging in “public participation” or signing onto joint letters. Lawyers who coordinate or provide a platform for such public actions will face particularly significant legal risks. Of course, representing clients in litigation is another, perhaps safer way that lawyers can participate. However, at least so far, victims have not come forward seeking to file lawsuits. This is another reason why lawyers cannot be seen. From the very beginning, however, China’s #MeToo movement has sought to design and establish mechanisms that impose legal responsibility on perpetrators of sexual harassment. This process will need to involve lawyers, and so there still may be a role to play. Moreover, if such mechanisms are created and able to provide victims with meaningful remedies, more people may call on lawyers to help them use litigation to remedy the injustice they suffered. The ripple effect of the #MeToo movement in the West caused Hong Kong, a usually silent observer, to start speaking. A city under colonial rule for a long time and still searching for its identity, its silence on many issues is understandable. Although a very Western city, Hong Kong has Eastern traditional values in terms of the treatment of women, gender stereotypes, ingrained patriarchy and sexism, and sexual abuse. But no one spoke out loudly on these issues until the #MeToo movement in the West; the emergence of high-profile cases caused women to find their voices and yell loudly. The uncensored social media that the city still enjoys, as compared to mainland China, has become a vehicle for these brave women to come out and tell their stories. A local Hong Kong athlete spoke out about being abused by her coach and the city outpoured its support. It also encouraged other women to speak out. According to the local non-governmental organization (NGO) Rain Lily, one in seven women in Hong Kong has experienced sexual harassment at work. Due to a variety of factors, migrants and ethnic minorities usually keep quiet about the assaults they suffer. One factor that plays a big part is the fear of victim shaming; another is the fear of retaliation, such as losing their jobs or being branded as trouble-makers. It’s easier for these women to switch jobs than to lodge a complaint. The #MeToo movement mobilized government agencies and NGOs in the city, but is it enough to protect the women of Hong Kong society, where they are still very much underrepresented? The city is working towards equality, hence having a female Chief Executive, but there have still only been baby steps towards creating a workplace for women that is safe and where they are not paid less than their male counterparts. Men in Hong Kong should not be excluded and they should not be scared of these conversations because we need them more than ever as allies. Encourage them to speak out rather than be silent observers, or worse, cast doubts over the movement. The backlash from men also started to creep onto social media, with some saying that the movement is just a trend that Hong Kong women adopted from the West.